Today is National Strawberry Parfait Day. We just published a July 4th breakfast parfait recipe, but the original parfait was made from ice cream. In the U.S., a parfait is a layered sundae. It can be simple, with alternating layers of ice cream and syrup, or a mélange of ingredients as shown. Parfait is the French word for “perfect.” The word means something different in France: It’s the original French sundae, made with a custard-base ice cream (“French” ice cream, made from a base of sugar syrup, egg, and cream); then flavored with fruit purée and whipped with a lot of air to a delicate texture. The recipe can be made at home with no special equipment. It contains enough fat, sugar, alcohol and whipped air to allow it to be made by stirring infrequently, as it freezes (granita is made the same way). The process interferes with the formation of ice crystals: As in the production of regular ice cream, the mix is agitated constantly while it freezes (or chemically by adding glycerol) [source]. In a French parfait, the ice cream is not scooped but pre-frozen in individual serving containers—typically the long, tapered parfait glasses, narrower versions of sundae dishes. The frozen dessert dates to 1894. In France, parfait refers to a frozen dessert made from a base of sugar syrup, egg, and cream. In America, a “parfait” became a particular type of sundae, different from the French parfait. An American parfait layers syrup and other garnishes (originally, bright-colored fruit gelatin was used) between layers of ice cream, in a tall glass. It is then garnished with whipped cream, fruit, liqueurs, nuts, and these days, sprinkles and gummy bears. instead of adding them all on top like a sundae. The concept expanded to fruit, yogurt and granola parfaits; pudding parfaits; and even savory parfaits like this Mexican Parfait with tomatoes, beans, jalapeño, plain Greek yogurt and tortilla chips; and this Buffalo Chicken Parfait. Check out the different types of ice cream preparations in our Ice Cream Glossary, along with the history of the parfait. One great thing about parfaits: You’ll never run out of combinations! 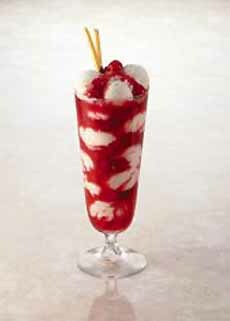 An American-style strawberry ice cream parfait (photo courtesy Wisconsin Milk Marketing Board). 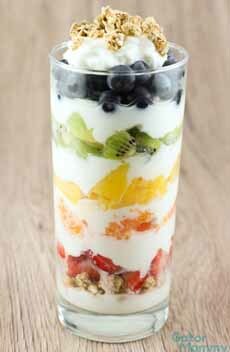 A fruit and yogurt parfait with granola. Here’s the recipe from Sugar Spice And Family Life. A French-style parfait: no layers, just frozen creaminess. 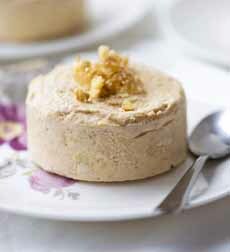 Here’s the recipe from Mondomulia, made with walnuts and walnut liqueur. 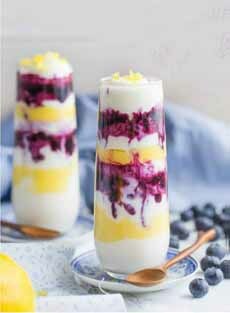 An American-style parfait with blueberry sauce and lemon custard. Here’s the recipe from Baking A Moment.